Hand-crafted from the latest hi-tech metal alloys, the C40 S is a heavy-duty fluid action head specifically designed to support studio configurations or 35mm film cameras. 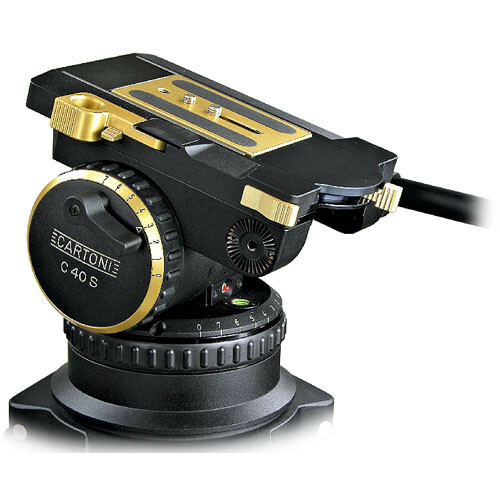 The counterbalance system activated by an 8-position easy-grip selector, combined with a 150mm sliding base plate, allows the cameraperson to fine tune an extremely wide range of cameras weighing from 22 lbs to 100 lbs throughout a tilt range of +80/-60 degrees. Features a patented fluid drag control system for both pan and tilt functions allowing the damping levels to range from "0" for freewheeling to "7" for maximum drag. Also equipped with a built-in illuminated spirit level, two telescopic handles and a standard flat Mitchell base. 3-fluid damping modules, which assure outstanding, drag levels and extraordinary smoothness in both pan and tilt functions.